From grocery and department stores, to fuel stations and convenience stores; credit cards, debit cards, fuel cards and gift cards must be accepted and processed in real-time to keep retail businesses moving. While most new Point of Sale (POS) installations will take advantage of broadband and LTE networks for transaction processing, there remains a significant installation base which requires support for dial-in processing over public telephone networks utilizing analog data modems. POS terminals use a specialized modem feature set that is tailored to the quick and accurate processing of payment transactions. This means that standard off the shelf modem banks will not be adequate replacements for POS applications and the payment processing center will require modem banks which support these POS features. Transaction processing must utilize error free communication channels to ensure the accuracy of financial settlements. Analog modulations are inherently prone to bit errors so communications protocols are utilized which verify the integrity of the received data stream. These protocols including High-Level Data Link Control (HDLC) and Synchronous Data Link Control (SDLC), which both provide error detection through the use of a 16-bit or 32-bit Cyclic Redundancy Check (CRC). Upon detection of a damaged frame, Automatic Repeat Requests (ARQ) can be issued to the transmitting modem to facilitate a retransmission of the data. Additionally, time optimized and non-standard modem negotiations such as V.22 FastConnect, V.22bis FastConnect and V.29 FastConnect are used. Standard modulations could require fifteen to thirty seconds for their connection time before they can begin the transaction processing. These FastConnect optimizations ensure quick authorization by reducing the time required to establish a data channel (under four seconds). The exact set of features utilized for POS will depend on terminal vendors and software implementation. A POS modem bank must be able to support all of the variations deployed within the customer base. As these specialized hardware platforms reach the end of their service life, replacement options are no longer being manufactured. These legacy hardware solutions also require expensive PRI connections which many telephone carriers no longer provide. This makes POS payment processing a perfect candidate for migration to Voice over IP (VoIP) based technology. 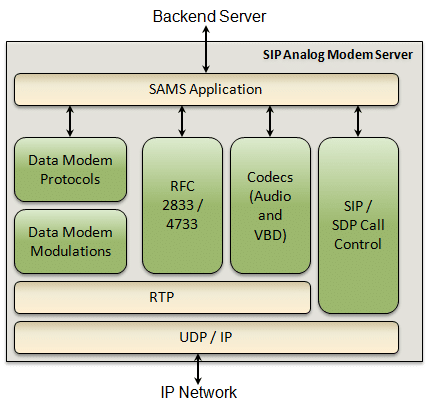 VOCALs SIP Analog Modem Server (SAMS) can offer this feature set in a fully software based package removing the need for old hardware and expensive PRIs while introducing the flexibility of cloud based deployments. Compatible with ppp and pppd etc. Modem as a Service (MaaS) – Ideal for environments where the user is hosting the virtual modem as a service for customers. MaaS provides advanced line provisioning, phone number and modem line allocation, and SSL encryption. Point of Sale (POS) Support – Useful for POS transaction processing applications. This option includes FastConnect modulation variants, specialized POS data protocols, as well as automatic TCP connection origination to back end servers for incoming calls.